Rarely discussed, corporate and government pensions, are barreling towards disaster. For some reason, there is an assumption that what ails the government, with their $20 trillion in debt, isn't something that ordinary folk need to worry about. After all, times are good and corporate stock prices are near record highs, people are working, and even wages have been increasing. But beneath the shiny veneer is a sickness that is festering, a red nightmare of underfunded pensions, both on a government and corporate level. They menace over markets like an explicit threat, a promise of crisis that is both maturing and spoiling with equal violence. Former Dow component, and once upon a time great American company, has an underfunded pension of $31 billion and a business that is in the midst of restructuring. The stock has been cut in half over the past year. But at a time when General Electric Co. is facing what amounts to an existential crisis, a $31 billion deficit in its pension plan may complicate any turnaround that involves a breakup of the 126-year-old icon of American capitalism. Divvying up the obligations won’t be easy. After all, GE owes benefits to at least 619,000 people. And retirees aren’t the only ones at risk. Ideally, breaking up a conglomerate as sprawling as GE would unlock value for shareholders, who have seen their stock fall 40 percent since the CEO took the reins from Jeffrey Immelt in August. Stronger divisions wouldn’t be dragged down by weaker ones, and each business would stand on its own financially. 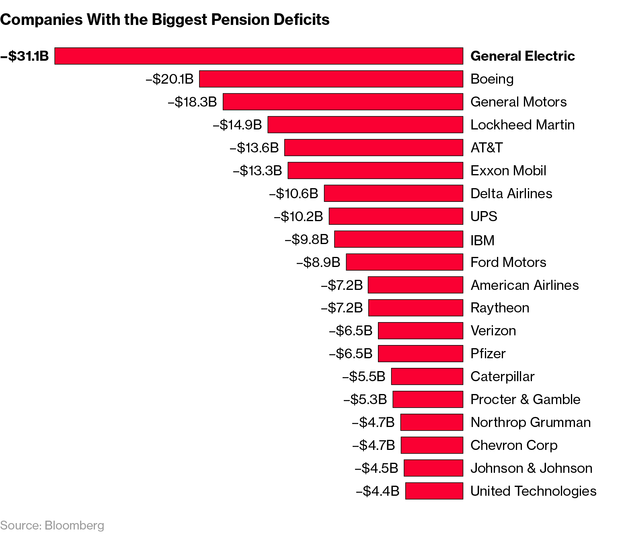 Here's a nice genteel list of the top corporate pension deficits in America. The municipal deficit is far more insidious, $6 trillion in the hole. The PBGC, which is a federal agency charged with protecting US pensions for firemen, cops, and municipal workers, have seen their deficits soar in recent years. The Pension Benefit Guaranty Corporation’s Fiscal Year 2017 Annual Report, released today, shows that the deficit in its insurance program for multiemployer plans rose to $65.1 billion at the end of FY 2017, up from $58.8 billion a year earlier. The increase was driven primarily by the ongoing financial decline of several large multiemployer plans that are expected to run out of money in the next decade. 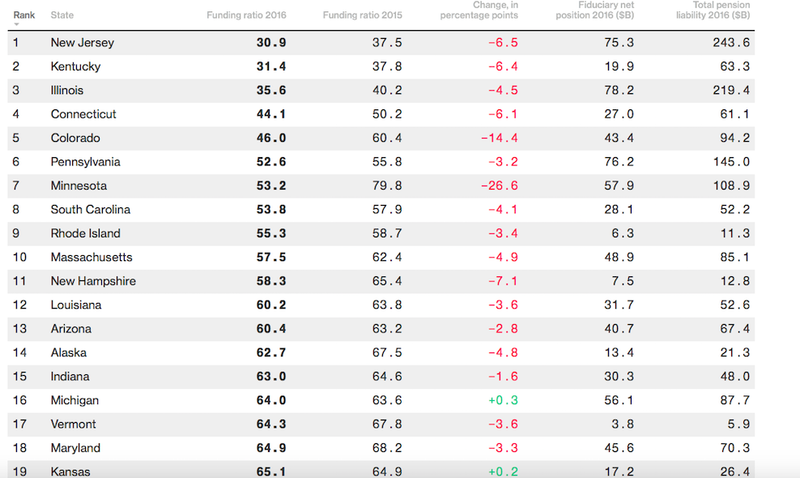 The largest pension fund in America, CalPERS, has ~$350b invested and have recently reduced cash from 4% to 1%, in an effort to perform better. 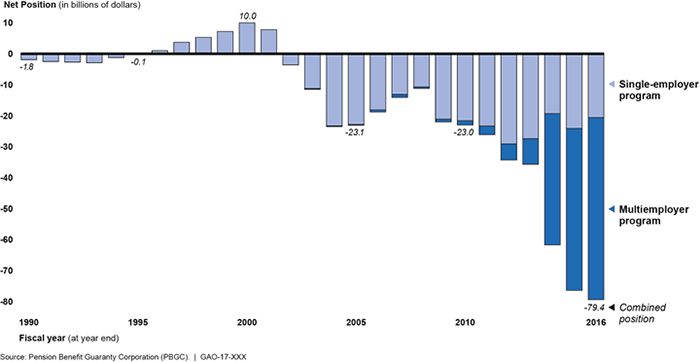 Bear in mind, during the financial crisis the fund shed $100 billion, losing 24% in 2008 alone. The fund went from being 101% covered in 2007 to 89% in 2008. With markets gleefully soaring since then, one would assume, even presume, the coverage ratio to be significantly higher, yes? You'd be wrong. In spite of stellar performance and robust contributions, pension funding is only 71%, up from 68% last year. The fund doubled its projected return last year, netting 15.7%. CalPERS investment allocation for 2017. It's widely believed that once pension coverage hits 50%, that is, in fact, the point of no return. It'd take a giant miracle of Warren Buffet proportions to make up such a deficit. 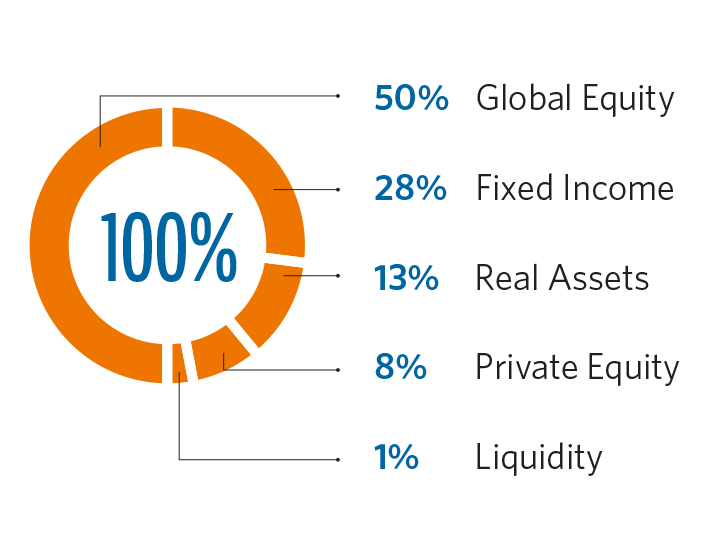 With investment allocations at 28% fixed income, 50% equities, it's damned near impossible to do. According to Pew Charitable Trusts, the cumulative pension gap is ~1.4 trillion, at just 66% coverage. Presently, there are 5 states in the union below the point of no return (50%). Now if you juxtapose that against the $375b deficit on the corporate side, the corporates don't look too shoddy. After all, their coverage for defined benefit plans jumped 4.7% in 2017 to 89.2%. Bottom line: the situation at the most sacred investment funds in America are truly in dreary condition, far worse than during the financial crisis -- thanks to ballooning obligations. Could you imagine if the market dropped by 30% in a year, what the situation might look like across the country? Side addendum: Here in NYC, a veteran NYPD officer gets paid $110-$175k per annum. Once retired, said cop gets half that amount for life, including benefits. There are 38,000 cops in NYC and these insane salaries are the result of runaway cost of living increases in the city.